An artist’s interpretation of what Lingwulong shenqi may have looked like. The gigantic, long-necked sauropods are an iconic group of dinosaurs—and it seems scientists have just discovered a new one. Paleontologists were able to define the new species, known as Lingwulong shenqi, using seven to 10 partial skeletons from four separate dig sites in China. “The discovery of Lingwulong pushes back the origination times of many of the groups of sauropod dinosaurs that we think of as most iconic, and challenges many conventional ideas about the early biogeographical history of dinosaurs,” Philip Mannion, a study author and paleontologist at Imperial College London, told Gizmodo. Lingwulong fossils are shown partially exposed here in one of the four Chinese dig sites. 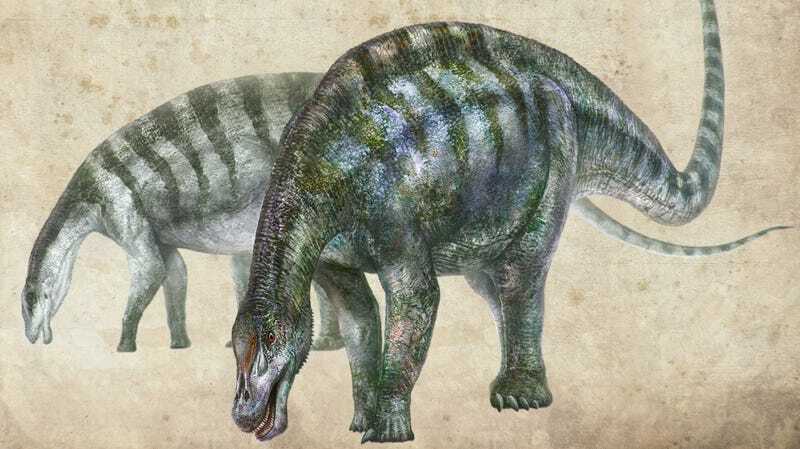 John Whitlock, a paleontologist at Mount Aloysius College who wasn’t involved with the new work, said he’s skeptical that Lingwulong is truly a diplodocid. He told Gizmodo it’s possible that the dinosaur is more related to Middle Jurassic sauropods from China called Mamenchisaurus or Omeisaurus, thanks to similarities in their skulls and vertebrae. It is still possibly a diplodocid, he said, because it’s so old and primitive that it may just not have evolved what we think of as a typical diplodocid skull yet.